12th International Symposium on Advanced Ovarian Cancer: Optimal Therapy. Update. 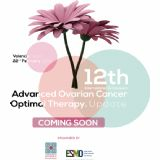 The 12th edition of this symposium, organised by ESMO and GEICO is the ideal environment to discuss both new and standard approaches to the treatment and management of ovarian cancer.